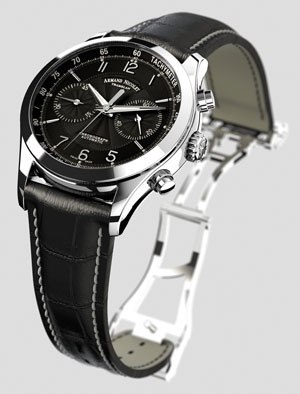 Armand Nicolet revisits one of its successful collections and offers the public an entirely restyled M02 chronograph. This successful reinterpretation according to modern codes places particular emphasis on comfort. Its weight is lighter in order to make it more pleasant to wear, and its legibility is also enhanced by a black dial displaying alternating hour markers and Arabic numerals. Available in a broad range of colours and materials, it will cater to all tastes.